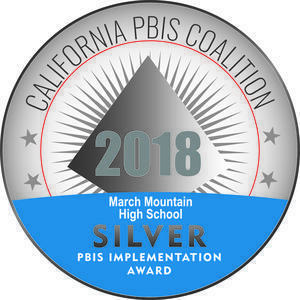 March Mountain High School is a continuation high school that houses a variety of programs specifically designed to meet the particular needs of students who have been unsuccessful at the comprehensive high school. March Mountain has approximately 300 students who attend classes from 8:00 A.M. to 3:00 P.M. and work at an accelerated pace with academic rigor to assist with credit recovery. To further assist students with credit recovery, concurrent enrollment in Adult Education is available for seniors on a limited basis. In addition, students may enroll in online credit recovery classes or work experience classes to earn credits. Independent Study is also offered for those students who have extenuating circumstances. The Cal-SAFE program provides parenting classes for students with children or for those who will be having a child. The program also provides school-time childcare for the babies. Special Education programs serving March Mountain students include the Resource Specialist Program (RSP). English Language services are also available through the Transitional Language Program (TLP). Due to the type of instructional programs offered, students need to score a three or better on the English Language Proficiency Assessments for California (ELPAC) in order to be successful. In order for a student to receive a high school diploma at MMHS, he/she must complete 225 credits in required subject areas and be accountable for all State and District requirements including one year of Integrated Math or Algebra 1. At MMHS students are able to earn 90 credits due to accelerated six-week terms. MMHS has 53 classrooms, 49 permanent classes, four portables, a gym, a locker room, a library, and an administration building. The main campus was built in 1959 and the school opened in 1959. March Mountain High School is a unique alternative educational setting. Staff provides individualized instruction within a caring, safe environment. The staff strives to help each student develop both personally and academically. March Mountain encourages parental and community involvement. Parents are invited to participate on school committees and to provide support for the student activities programs. Parents are actively involved in the registration process and must attend an orientation with school officials prior to the student being enrolled at March Mountain. Each year, all parents are asked to respond to an in-district evaluation of the school. March Mountain also holds parent/community nights during the school year.